In 1976 Quadrino was made assistant to Cesare Romiti, FIAT’s then CEO, at the age of 30. He served in this position until 1980, when he was appointed Accounting and Control Manager of the group. 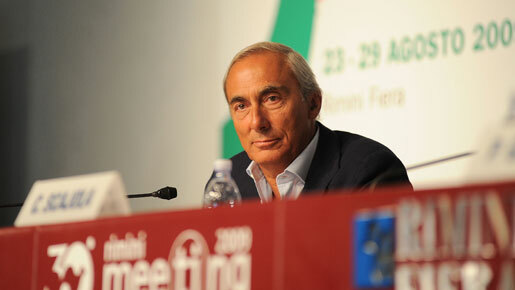 Between 1982 and 1991, Quadrino held a variety of management positions within FIAT’s manufacturing subsidiaries, serving first as Finance, Accounting and Control Manager and head of international operations at IVECO (Commercial Vehicles Division) and later, in 1987, as CEO of Gilardini (Industrial Components Division). Following a recall to head office in 1991, over the next decade Quadrino held senior positions in FIAT’s non-automotive divisions, including agricultural and construction equipment, aviation, rolling stock and railways systems, engineering, metallurgic products and production systems. In 2001, following the takeover of Montedison by Italenergia (in which Fiat held a majority interest), he was appointed Chairman both of Montedison and Edison, which were later merged into one company. In 2005 he became the CEO of Edison. When Quadrino took to the helm of Edison, he inherited a business that had grown from the dawn of the age of electricity to become Italy’s leading independent power producer. With reserves of 35.5 billion cubic meters of natural gas being distributed directly to over 170,000 retail customers, the company’s core natural gas exploration and production business was in a strong position, but with global oil reserves in decline, Quadrino saw that it was deficient in other areas, such as new and renewable energy sources. Immediately, Quadrino began ramping up Edison’s renewable energy business, with the result that today the company has 12,100 megawatts of hydroelectric and wind-powered generating capacity. Quadrino has proved himself to be a shrewd strategist. In June 2009, he announced that Greece would be Edison’s main strategic focus outside Italy, as here the company was already the second-biggest power operator through its joint venture with Hellenic Petroleum. His idea was to take a stake in Greece’s natural gas monopoly, DEPA, with a view to building a pipeline for the supply of gas from Greece to Italy. The Greek government, which owned 65 percent of DEPA, had just abandoned its plans for a public flotation and were instead trying to identify a key strategic investor to take a 33 percent stake in the operation. At the same time as revealing these plans, Quadrino also said that Edison was aiming to invest in renewable energy operations in Turkey, Romania, Serbia and Bulgaria. Quadrino has also shown that he does not shy away from making tough strategic decisions, even if they ruffle the feathers of fellow energy firms. In October 2009, he announced that Edison would reduce its reliance on natural-gas supplies from its main competitor, ENI, by taking advantage of Italy’s newly-constructed liquefied natural gas terminal. According to Quadrino, the Rovigo terminal, with an annual capacity of 8 billion cubic metres of liquefied natural gas, would ‘significantly reduce’ Edison’s dependence on supplies from ENI. Edison took a 10 percent stake in the new Rovigo facility and signed a deal to use 80 percent of the terminal’s full capacity – or 6.4 billion cubic meters – for 25 years. The move was also strategically important for other reasons. Italy had become one of the most important markets for gas from Qatar – a leading global supplier of liquefied natural gas – with the further opportunity of becoming an entry point for imports to Europe. As a result, Quadrino predicted that Italy would be in a position to sell gas to other EU nations by 2016 and that Edison’s own gas supplies would reach 23 billion cubic metres by 2013, a significant rise from the then 13 billion cubic metres produced. However, not all of Quadrino’s strategic moves have gone according to plan. In April 2008, Edison won the tender for Egypt’s Abu Qir field – in a deal valued at $3.1bn – which had reserves of between one and 2.5 trillion cubic feet. But by mid-2009 it was clear that the plan was not working, as Quadrino announced that Edison was looking to sell a 25 percent stake in the Egyptian gas field by early 2010. And even this proposed divestment hit the skids, as the global economic downturn took control of the situation. In September this year, Quadrino said that plans to sell the stake had been put on hold indefinitely. However, on balance, Quadrino’s strategy has proven to be sound. Edison’s Q1 2010 EBITDA rose 8.8 percent to €321m, as power and gas demand picked up after being hit by the global economic crisis in 2009. In addition, Q1 net profit surged by 91 percent to €67m. Quadrino also outlined plans to boost client numbers a third to one million by the end of 2010, from the 750,000 at the end of Q1. This prediction was based on the overall 18 percent rise in the number of clients in the global energy markets and the 11 percent hike in the end client base in the gas business. His comments are vilified. With Norwegian supplies likely to deplete at a pace, Europe will have to turn to Russia and China for its oil. Furthermore, the UK has closed down many of its old nuclear plants and will have to find some 20 percent of its electricity from abroad. Unlike some of his counterparts in the European energy sector, Quadrino has not been faced with many serious challenges. Prior to his stewardship, Edison was run as a steady ship, and accordingly he has been able to focus on developing the company, as opposed to tackling fundamental issues. Whereas some M&A decisions have not borne the fruit he expected, most of his more successful decisions have been based on a sound understanding of the business, no doubt thanks to a lifetime’s work within the company. His business acumen is evident both in terms of his distancing the business from competing energy suppliers and the ability to predict the changing nature of the global industry, both of which are sure to stand Edison in good stead to face the challenges posed by the declining dependency on fossil fuels and the shift towards renewable energy.